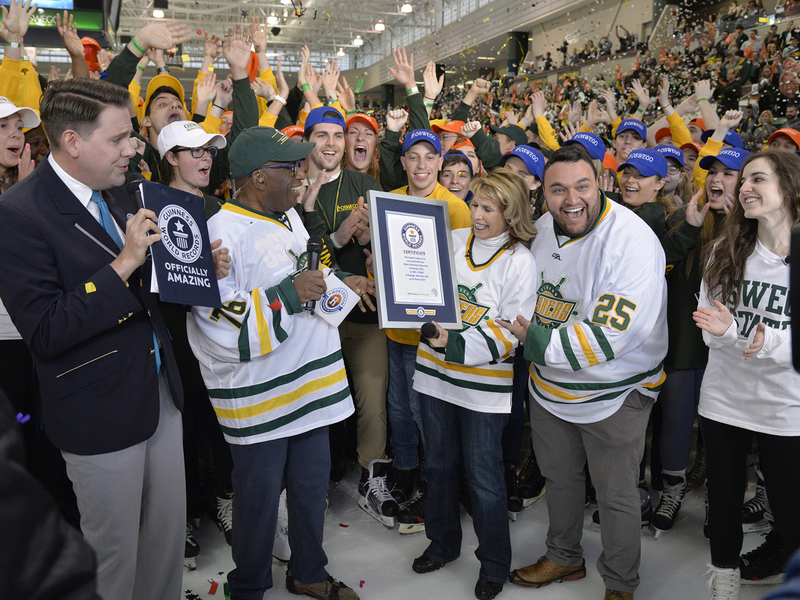 This morning (March 31), 593 SUNY Oswego students and staff broke a Guinness World Record, performing the longest conga line on ice in the Marano Campus Center arena during a live broadcast of NBC’s Today show, hosted by Oswego alumnus Al Roker '76. The record-shattering line of dancing skaters concluded a five-day series of new world records on American college campuses -- all part of “Rokerthon 3: Storming into the Madness,” led by Today co-anchor Roker. "We are truly thankful and proud of the participation of so many from our campus community," President Deborah F. Stanley said. “Our students seized the opportunity because they had pride we could do it, and a fantastic team contributed intensive planning, collaboration and coordination. Today, we showed the nation that when SUNY Oswego sets out to accomplish something, we come together to get the job done!" Oswego's newest world record holders skated in formation for five minutes before a crowd of hundreds of campus and community members to Gloria Estefan and the Miami Sound Machine's “Conga.” They topped the former record of 353 set on Nov. 12, 2013, at the Ice Rink Canary Wharf in the United Kingdom. Just before 8 a.m., the skaters passed through turnstiles and swiped college IDs as adjudicators from Guinness also counted each skater as he or she entered the ice. Ten referees, stationed throughout the arena, monitored skaters to ensure each one accurately performed the familiar conga step while their hands were connected to the waist of the skater in front. Guinness adjudicator Michael Empric and Roker presented the record to college President Deborah F. Stanley and senior broadcasting major Justin Dobrow during the live broadcast of Today. SUNY Oswego was one of five colleges -- the universities of Tennessee, Oklahoma, Marquette and Northern Michigan were the others -- selected to participate in Rokerthon 3 based on a video student submission, led by Dobrow, the general manager of Oswego's student-run TV station WTOP. The college had less than a month -- working around a spring break -- to organize the ice conga line, which included finding enough adult ice skates to equip all of the students. Nearby SUNY siblings Cortland and Morrisville were able to loan their skates to Oswego. Participants only had one rehearsal on Wednesday night to practice as a group on the ice, but their Oswego pride carried them through, adding another accomplishment to their resumes -- Guinness World Record holders. Roker, who generously and often mentions his alma mater on the Today show, last appeared at SUNY Oswego on Oct. 16, 2014. Appearing live on Today, his presence helped give a big boost to the college, its Lewis B. O’Donnell Media Summit and the public launch of Oswego’s ultimately successful "With Passion and Purpose" fundraising campaign. Record accomplishment – From left, Guinness World Records adjudicator Michael Empric and Today show co-host (and SUNY Oswego alumnus) Al Roker present SUNY Oswego President Deborah F. Stanley and the event's student coordinator, senior broadcasting major Justin Dobrow, with confirmation of breaking a world record for longest conga line on ice – with 593 participants -- during the live broadcast of Today on March 31.